Much of the game play in Costume Quest revolves around the costumes the children are wearing. In battle, the kids transform into much larger, awesome versions and of the costume they are wearing. Each costume grants a specific set of combat abilities and also has a special ability that is usable every few rounds of combat. Costumes are generally divided into three categories: offensive, defensive and healing. Creating a proper mix of costumes is critical to survival (having 3 offensive costumes is a bad idea, you’re party would lack any healing whatsoever and couldn’t sustain itself in a long fight). Some costumes do provide benefits outside of battle and are mandatory to get through the game (the robot costume allows you to skate over ramps, the Statue of Liberty costume lets you see in dark areas). Additionally, each character can equip one battle stamp. Stamps provide a variety of benefits including increasing your attack power, defense, or health. Others are less passive, giving you different attack options. For instance, “Egg On Your Face” is an attack that does a small amount of damage but also stuns the enemy for one turn. While the battle stamp feature is nice and allows limited character customization, a large majority of the stamps are simply upgrades to previous versions so there is a general lack of diversity to the stamps (e.g. small attack bonus, medium attack bonus, large attack bonus). Your characters do level up in the game, but getting newer, better costumes generally provides a much larger benefit (many costumes are direct upgrades to others). Battle are generally simple. Combat is turn based with the player selecting whatever action they would like to do for each character. Attacks have a timing based button press that allows for a little additional damage (also available while defending to decrease damage received). On the third turn (and every third turn after they use it) players can use their costumes special ability. Strategy comes in on deciding when to use those skills. Healing skills could be used on turn three, but players may choose to wait until their health is lower before using the skill. Graphics – The cartoon-style graphics look really sharp and fit the whole feel of the game nicely. In battle the costumes all look very cool, and some of the special attack animations are pretty amazing (Lady Liberty’s special is the best special attack I’ve seen in any game). 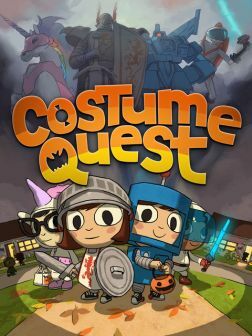 Atmosphere – Costume Quest does a very good job of capturing the Halloween feel. Your neighbor feels alive as you go door to door trick-or-treating. Leaves have changed color and are falling, other costumed children run around, Halloween parties are going on and bobbing for apples in the park all add to the setting. Story / Dialog – The story and dialog is very well written and funny. Though the plot is simple (save your brother / sister from the monsters) there are little twists along the way to keep things interesting. Mini games – I loved the bobbing for apple mini game found in each area. I also really liked the costume contest held in the mall. In order to win, you had to find the judges spread throughout the mall and figure out what they are looking for in a costume in order to ensure your party is wearing the right costumes to win. Collecting costumes – Not all costumes are mandatory and finding all of them is fun and rewarding (most costumes are direct upgrades of previous ones, so it pays to find them, and you definitely want to see all the unique special abilities). However, you won’t just receive a whole costume, you’ll instead receive the “blueprints” for the costume and have to collect all the parts to complete it. It’s Short – The game is just way too short. There are only three different areas in the whole game and everything can be finished fully in a few short hours. Sure, it’s a download-only game, but I expected more from Double Fine. Price – This goes hand-in-hand with being too short, the $15 price is just too much for such a short game. Otherwise a very well produced and enjoyable experience, I don’t think that only justifies the price. Repetitive – In each area you must go to each house (or store, in the case of the mall) asking for candy. Sometimes though, there is a monster who will answer the door (they’re stealing all the candy) and a fight ensues. You have to go to each house to make sure you’ve stopped all the monsters, at which point the monsters move to the next area and a boss fight ensues as you give chase. The problem is this is the exact same formula used in every single area and it gets boring. Sure, there are side quests and other unique things to do in each area, but the premise remains the same.